Dial Press Trade Paperback, 9780385340380, 320pp. From the author of the beloved #1 national bestseller Crow Lake comes an exceptional new novel of jealously, rivalry and the dangerous power of obsession. Two brothers, Arthur and Jake Dunn, are the sons of a farmer in the mid-1930s, when life is tough and another world war is looming. Arthur is reticent, solid, dutiful and set to inherit the farm and his father’s character; Jake is younger, attractive, mercurial and dangerous to know – the family misfit. When a beautiful young woman comes into the community, the fragile balance of sibling rivalry tips over the edge. Then there is Ian, the family’s next generation, and far too sure he knows the difference between right and wrong. By now it is the fifties, and the world has changed – a little, but not enough. These two generations in the small town of Struan, Ontario, are tragically interlocked, linked by fate and community but separated by a war which devours its young men – its unimaginable horror reaching right into the heart of this remote corner of an empire. With her astonishing ability to turn the ratchet of tension slowly and delicately, Lawson builds their story to a shocking climax. 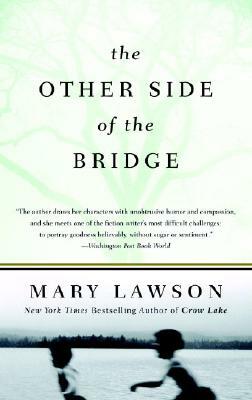 Taut with apprehension, surprising us with moments of tenderness and humour, The Other Side of the Bridge is a compelling, humane and vividly evoked novel with an irresistible emotional undertow. Arthur found himself staring down at the knife embedded in his foot. There was a surreal split second before the blood started to well up and then up it came, dark and thick as syrup. Arthur looked at Jake and saw that he was staring at the knife. His expression was one of surprise, and this was something that Arthur wondered about later too. Was Jake surprised because he had never considered the possibility that he might be a less than perfect shot? Did he have that much confidence in himself, that little self-doubt? Or was he merely surprised at how easy it was to give in to an impulse, and carry through the thought which lay in your mind? Simply to do whatever you wanted to do, and damn the consequences. Mary Lawson was born and brought up in a farming community in central Ontario. She moved to England in 1968, is married with two sons and lives in Kingston-upon-Thames. This is her second novel. How were you affected by the novel's prologue? What did you discover about Arthur and Jake in this scene? How did your perceptions of the brothers change throughout the book? How would you answer the questions that conclude the prologue? What accounts for the differences between those who follow the rules, like Arthur, and those who defy them? Which came more easily for you as an adolescent: obedience or defiance? How were Jake and Arthur affected by their family dynamic? Did their mother pamper Jake too much? Did their father favor Arthur because he was easier to manage, or was Jake difficult to manage because of his father's favoritism? What was the effect of the novel's timeline? How did it compare to your own experience of the continuum between present moments and memory? What parallels run between Ian's life and Arthur's? Discuss the use of the headlines that open each chapter. What do they say about the local and global concerns of humanity? In what way were the headlines timeless, and in what way did they convey the unique attributes of this locale? What headlines would be most significant in marking the chapters of your life? What is the significance of the two time periods in the lives of the characters? How were the Dunn brothers shaped by a youth of economic hardship and the presence of POWs? How was Ian shaped by an era of greater liberation, with television for entertainment and "risqué" music on the radio? What dreams for the future did each of these generations possess? Discuss the nature of love and marriage as described in the novel. What made Jake so irresistible to Laura? What made Dr. Christopherson's wife choose another man? Was Laura's appeal strictly physical when she first moved to town? What is the riskiest romantic decision you have made? How are the characters shaped by the novel's setting? What do the natural surroundings of the town mean to them? What separates those who want to escape from those who bask in the town's familiarity? Why is Ian so transformed by the "day of the dragonflies" that concludes chapter nine? What did these memories mean to him? Discuss the novel's title. What does it mean for the characters to reach the other side of the bridge? Could Jake and Arthur ever be free of the wounds they inflicted on each other? Who ultimately was responsible for Jake's fall from the bridge? Who ultimately paid the price (literally, in terms of his medical bills, and figuratively as well)? How did you react to the knowledge that Ian followed in his father's footsteps after all? Did he make the right decision? Laura confides in Arthur soon after meeting him, telling him she doesn't believe that God cares about humanity (Chapter Ten). How would you have responded to her? Discuss the cycles of tragedy conveyed in the Dunn family history, from the death of Arthur's father to the closing scenes of Carter. How do characters cope with the concepts of fate versus intent? How do they cope with regret? What common threads link the families in this novel to those in Crow Lake? What makes rural landscapes so appropriate for both of these storylines? Do you think people who grow up in cities feel the same passion for them as the characters in these two novels feel for the land? If Matt Morrison, the brilliant and adored older brother in Crow Lake, had wandered into this book, which character do you think he would have had more in common with, Ian or Pete?